These prompts evaluate performances of the Star Spangled Banner. They are similar to a mini-unit on National Anthems, but you could do this with any musical performances – even those from your own school! Monday: Think of your favorite song, piece of music, or performer. Make a list of the things that make it/them your favorite. Tuesday: When someone says a musician performed well, what types of things do you think they heard? What didn’t they hear? Wednesday: Listen to/watch the following performance. What does the performer do well? What could the performer do better? How would you rate the overall performance? Friday: Write a paragraph recommending one person to perform the Star Spangled Banner at an event. Be sure to include three musical reasons for your recommendation. You may also include suggestions to improve the performance. Monday: Make a list of all the places and sources of music you hear in a week. Tuesday: What would your life be like if the music was gone from all the places and sources you listed yesterday? 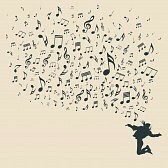 Would you miss the music? Why or why not?